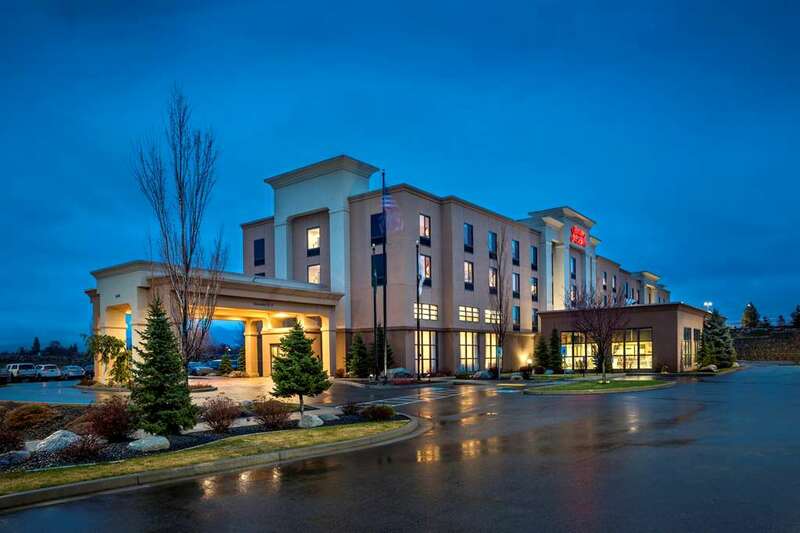 At Hampton Inn and Suites Spokane Valley you*ll find exactly what you need. Whether you*re traveling for business or pleasure in our beautiful rooms and one room suites you*ll enjoy all the extras our hotel has to offer. Along with earning Hilton HHonors points and miles you will enjoy free hot breakfast free stay for children under 18 accompanied by parents exercise facilities. and the 100 Hampton Guarantee. You can start your weekday morning with a free USA Today in our lobby while relaxing with a free cup of coffee or tea. offered 24 hours a day. Each room features contemporary furniture with a 32 inch flat panel LCD TV. Rooms include free hardwired or wireless high speed internet access clock radios free local calls no surcharge for using a calling card a coffee maker an iron and ironing board in-room movie channel and the Cloud 9 bed The Hampton Experience. Our location is ideal for anyone on the go in the Spokane area. A quick hop onto I-90 to head East or West being just minutes from Downtown Spokane or Idaho and conveniently located next to the Spokane Valley Mall and many other great shopping areas. A quick walk to the Centennial Trail will start a wonderful jog walk ride or work out with the beautiful view of the Spokane River. We are also close to many corporate areas and less then 2 miles from the Spokane Business and Industrial Park. We look forward to seeing you.